That's her, Dargo. She was in "The Great Ziegfeld" with William Powell and Pat Nixon. She also played "Little Orphan Annie" on the screen. 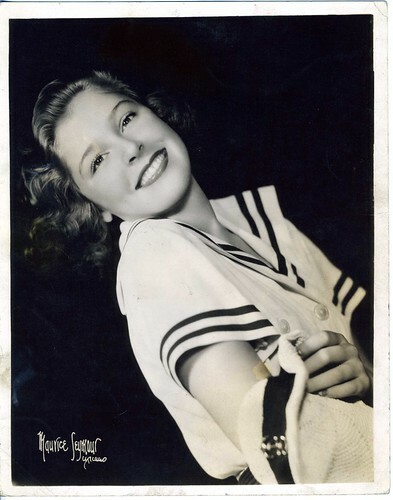 Now, here is a young actress who went from movies to Broadway, much like Jean Darling did. Later, she worked with Abbott and Costello. Do you know her? 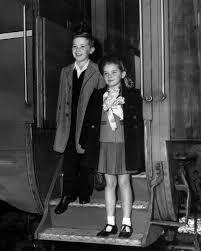 And like Jean Darling, she worked with Jackie Cooper and "Our Gang". As an adult, she changed her hair style and her look. She and Ann Gillis had something very much in common. Do you know what that was? Here's another chance for everyone to identify this young actress. Until Shirley Temple came along, this girl was one of the most popular child stars in Hollywood. Have no idea. She looks like a little Louise Brooks though! Yes, Lavender got her. It's Mitzi green. She and Ann Gillis both played Becky Thatcher in movies about Tom Sawyer. It's hard to find a lot of video of her. Here is an interesting short film from 1932 where she sings. You can also see her in this all-star short. Now, here's an easy one. Who is this lad? In that "grown up" picture, he looks a bit like Michael Ansara. Yes, Lavender got him. It's English actor Terry Kilburn. "a chistmas Carol" was just shown again this weekend. 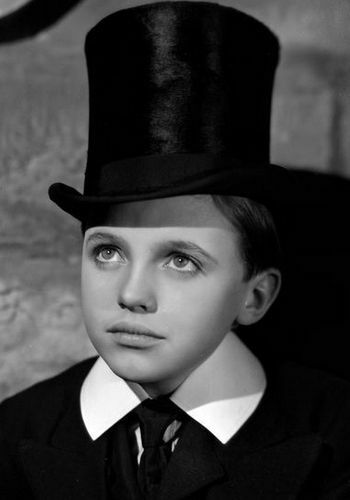 Did you notice young June Lockhart as one of the Cratchit children? 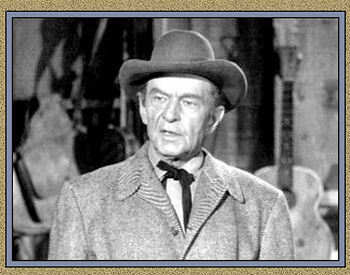 Terry Kilburn played horse grooms in both "National Velvet" (1944) and "Black Beauty" (1946). Now, do you know this actor who was in many "B" pictures? He once was a stunt double for Johnny Weismuller. Here he is with his wife, Elaine DuPont. twinkeee, where are you? What happened to you? If you can, please send someone an email or PM and let us know what happened to you. Thanks. Musicalnovelty got the last one. 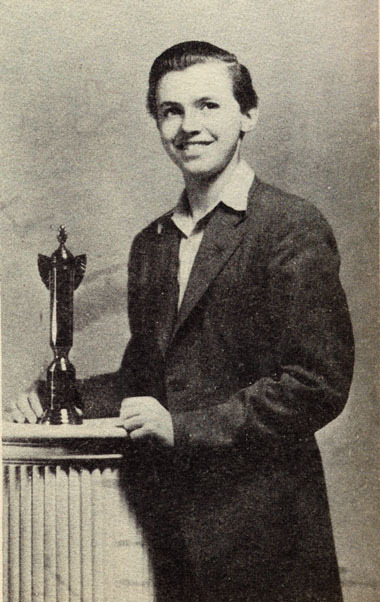 Ray "Crash" Corrigan was one of "The Three Mesquiteeers" in the thirties. The picture in the middle is from a serial called "The Undersea Kingdom" with Lon Chaney Jr. as a villain. Now, here is a man who specialized in playing con men, carnival barkers and snake oil pitchmen. He had a long career, so there must have been lots of demand for that type of role. Do you know him? You got him, MN. Earle was in over 300 movies and TV shows. Speaking of westerns, Here is an actress who was in her share with Roy Rogers, Gene Autry, and others. She also made non-westerns. She was billed under two different names in her career. Do you know her? She also worked with Lloyd Bridges. I do wish we could get twinkeee back. She is a nice lady who lives in Canada. And she is very good at this particular game of recognizing faces. She is a master of identifying actors just by looking at their eyes. I've heard she is alive and well, and we need to get her back on these TCM message boards. Please. That's Lynne Roberts, who used the name Mary Hart early in her career. Musicalnovelty is correct. Lynne Roberts started in movies as a teen. Republic Studios changed her name to Mary Hart and put her in a series of movies with young Roy Rogers. After a few years she tried working at other studios, but her career stalled and she came back to Republic, but this time with her original screen name of Lynne Roberts. When Gene Autry came back after the war, she worked with him several times. His first post-war film was "Sioux City Sue". She was his leading lady in that one as well as "Saddle Pals", which just aired this past Sunday on the Encore Western Channel. She also appeared several times on Gene's TV series in the fifties. Her real name was Theda Roberts. Her mother was a big movie fan and named her after Theda Bara. Now, we have had singing cowboys. Have we had singing cowgirls? This next actress qualifies. If you worked at Republic as she did, you were going to appear in westerns. Do you know her? Right again, MN. Here is Ruth in a clip from a Roy Rogers movie. 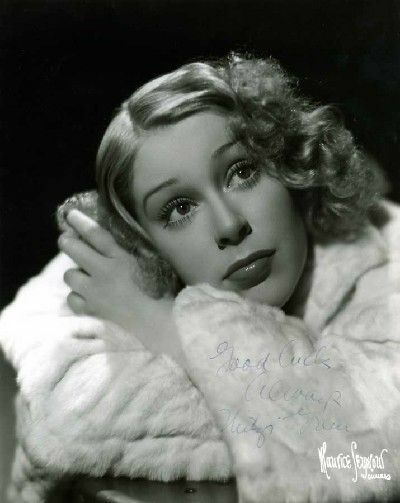 Now, here is a versatile actress who never quite made it to the "A" list, although she did work with such stars as Clark Gable, Fred Astaire, and Gene Autry. Do you know her? Use the scroll bar at the bottom to see the first picture. Here she is dancing with Fred. She wasn't always so blonde. Virginia Dale - best known, perhaps, for her role in HOLIDAY INN (1942) with Fred Astaire and Bing Crosby. 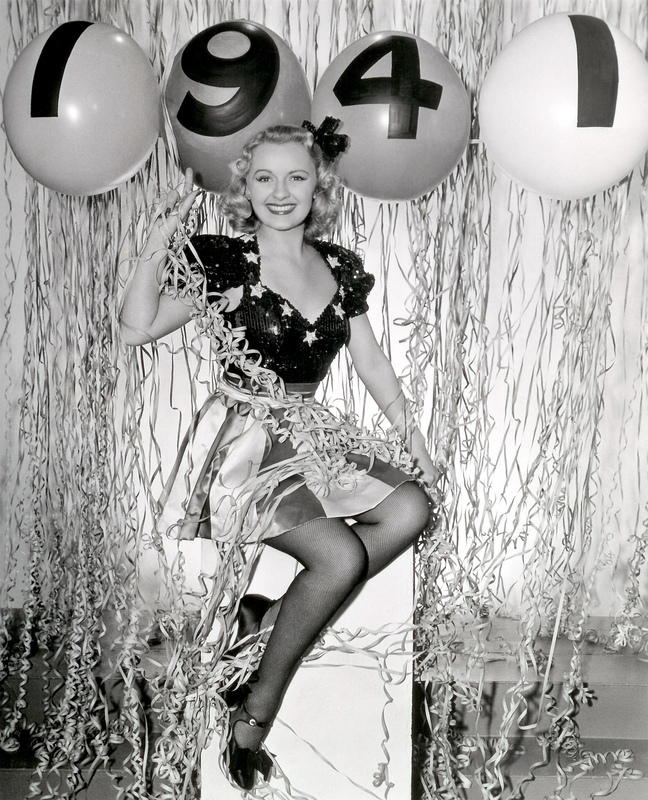 You mentioned you had your TCM Boards "birthday" recently - looks like today, Dec. 19 is mine, same year as you! And we've got similar numbers of posts - you're ahead a bit though. Virginia Dale is certainly correct, MN. Now, here's an actress who started in movies in support roles in the forties and soon after became a leading lady. Do you know her? Sorry, not Janet Leigh. This gal once starred in a film version of a classic novel about a horse. You are correct, Lavender. 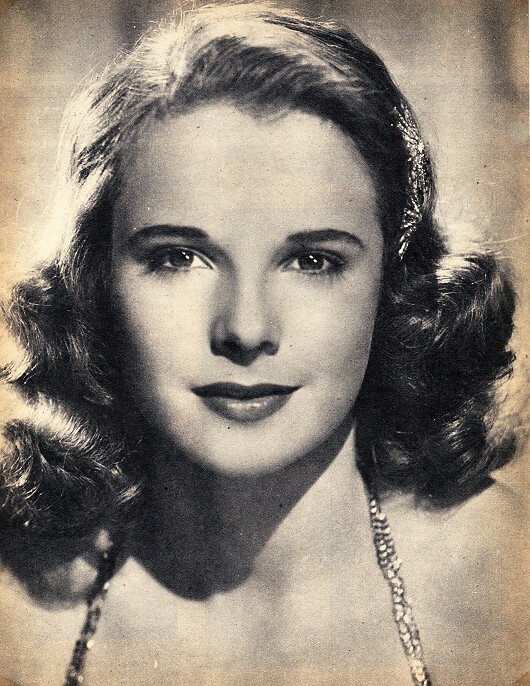 It is Mona Freeman and she did indeed star in "Black Beauty". Now, here are two for the price of one. Who are these two youngsters? 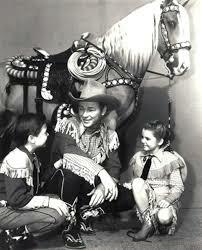 Here they are with Roy Rogers and Trigger.